Google is testing out a new feature that could do away with passwords entirely, letting users sign in using their own smartphones. The feature was revealed by Reddit user rp1226, aka Rohit Paul, who was invited by Google to test out password-less entry as part of an early-access program. Paul then posted a thread detailing the setup and sign-in process, complete with images and a Q&A brief sent by Google. To use a phone in place of a password, you must first sync up a compatible device with your Google account. Next, when attempting to log on to another device, Google will send a notification to your synchronized smartphone, where the attempt is verified by matching codes displayed on each screen. Since it replaces memorizing a password, Google highly suggests having some form of security on the smartphone in the form of a lock screen or Touch ID protection. Should the phone wind up lost, stolen, or simply out of juice, Google assures that passwords can still be manually entered. 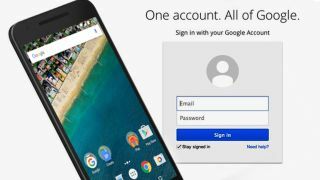 It is still unclear exactly which smartphones will become compatible with Google's new login method, though in Paul's case, a Nexus 6P was used. Google also mentions in a report by Android Police that it doesn't plan to be through with passwords just yet, as they still function as an additional layer of security against any suspicious-looking attempts on a user's account. Google isn't alone. Yahoo has been looking to forgo passwords for a while.